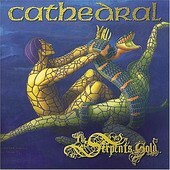 Cathedral is revered as one of the most important doom acts ever, and judging by this retrospective disc, you can make an excellent argument for Lee Dorian and crew's stoic contribution to the world of heavy music. Featuring 15-tracks of the driving gloom and subversive lyrics that made this English crew quite the underground entity, Th Serpent's Gold is a perfect introduction to a band that took the Sabbath sound and attitude of bands like Venom and St. Vitus and whipped it all together into a bastardized, doom-laden concoction. As an added bonus, the collection contains a second disc chock full of rarities sure to please the most ardent disciple of sludge. This release provides the most comprehensive coverage of this incendiary group, and it is an essential purchase for all who claim to be true followers of the doom rock genre.